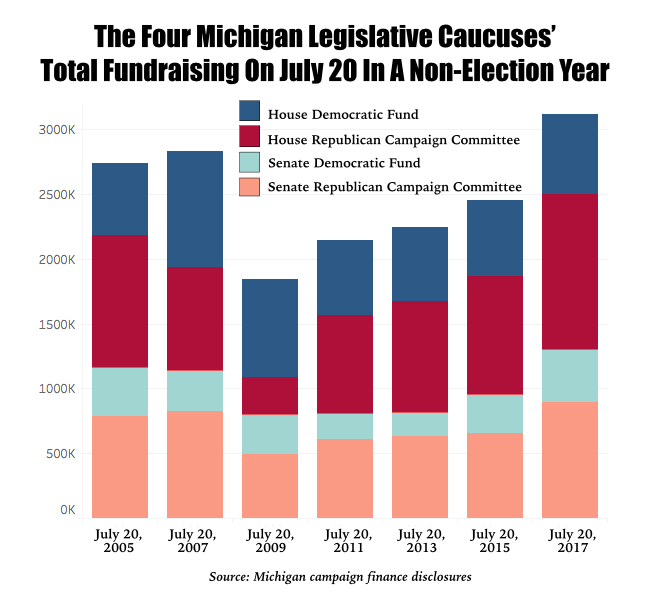 LANSING — The four groups that tend to spend the most money in races for the Michigan Legislature are off to a fast fundraising pace for the 2018 election. It’s an early indication that the cost of legislative races could be on its way up, once again. The main fundraising committees of the House Republicans, the House Democrats, the Senate Republicans and the Senate Democrats combined to raise $3.1 million in 2017 as of July 20, according to campaign finance disclosures due today. Over the last decade, the four committees had previously never combined to raise more than $3 million as of July 20 in the year before the election year. The previous July 20 high for an off-year was $2.8 million in 2007. The Senate Republicans’ main fundraising committee is the Senate Republican Campaign Committee (SRCC), which has raised $898,630 so far in 2017. The Senate Democrats’ main fundraising committee is the Senate Democratic Fund (SDF), which has raised $405,761 so far in 2017. The House Republican’s main fundraising committee is the House Republican Campaign Committee (HRCC), which has raised $1.19 million so far in 2017. The House Democrats’ main fundraising committee is the House Democratic Fund (HDF), which has raised $618,286 so far in 2017. The committees raise money on behalf of the four legislative caucuses and then channel the money into the most competitive races across the state. They often fund TV ads and campaign staffers. The committees’ new fundraising disclosures were due to the Bureau of Elections at 5 p.m. today. The 2016 election saw the most expensive battle for control of the State House on record., which cost at least $27 million. By July 20, 2015, the same point before the 2016 election, HRCC and HDF combined to raise $1.5 million. By July 20, 2017, they raised $1.8 million. Working to support the Republicans’ 63-seat majority in the House, HRCC is helping to drive up the fundraising numbers. In a press release on Tuesday, HRCC called its second quarter fundraising haul of $377,806 a record. The quarter went from April 21, 2017, through July 20, 2017. Top Donors For The Quarter Include: Michigan Values Leadership Fund II, a political action committee (PAC) connected to House Speaker Tom Leonard, Republican from DeWitt, gave $40,000; Peter and Joan Secchia, of the company Sibsco, gave $50,000; and the Blue Cross Blue Shield of Michigan PAC gave $20,000. Top Donors For The Quarter Include: Moving Michigan Forward Fund I, a PAC connected to Senate Majority Leader Arlan Meekhof, Republican from West Olive, gave $40,000; the candidate committee of Sen. David Hildenbrand, Republican from Lowell, gave $40,000; and Michael Jandernoa, of the company Perrigo, gave $20,000. 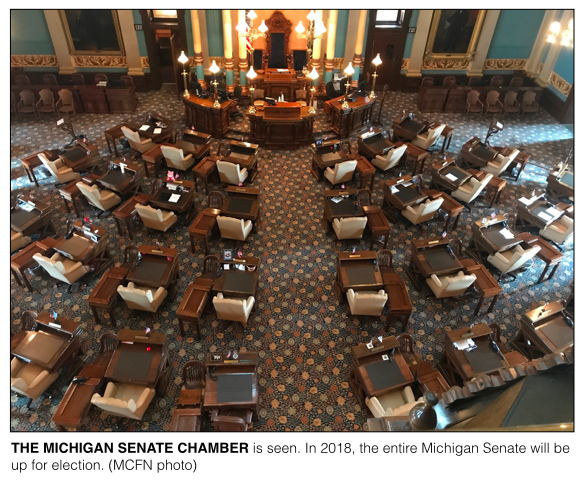 Top Donors For The Quarter Include: The candidate committee of House Minority Leader Sam Singh, Democrat from East Lansing, gave $30,000; the Michigan Education Association PAC gave $20,000; and the United Auto Workers Michigan PAC gave $10,000. Top Donors For The Quarter Include: The candidate committee of Senate Minority Leader Jim Ananich, Democrat from Flint, gave $30,000; the candidate committee of Sen. David Knezek, Democrat from Dearborn Heights, gave $25,000; and the Michigan Education Association PAC gave $20,000.